The gap between where we are and where we want to be struck me on Monday as I was reading about Sense Networks’ new Retail Retargeting service. The service aims to help mobile advertisers reach consumers based on where they’ve been and what businesses they’re likely to be nearby again. So, if someone is nearby a Target (s tgt) three times a day, five days a week, that might be someone Target or one of its competitors wants to, well, target with an ad before their next trip. However, as I looked at Sense’s list of the “top 50 brands with the biggest retail retargeting opportunity in mobile,” I noticed a problem — although I’m almost always within the presence of one of them, I only frequent a few of them. While I always seem to find myself nearby a Subway (ranked highly on Sense’s list because of its omnipresent nature, presumably), I can’t imagine the company could place an ad on Angry Birds good enough to lure me inside. Kevin Hannan, vice president of product management at Sense, told me that although its targeting isn’t yet perfect, it does make a difference for advertisers. Although the goal is to identify “shoppers” (i.e., people who actually shop at businesses) — something Sense’s machine-learning algorithms can help it discern when they gather enough info on someone — there’s certainly value just being able to identify “prospects” (i.e., people in close enough proximity to a business that they might become shoppers). With monetization, content owners are interested in a wider list of places users are nearby to increase the pool of potential advertisers. In terms of competitive intelligence, businesses are interested in fine grained data that can assign a person to a place, and furthermore, layer in index, affinity, and path. Location analytics from a product use case requires a combination of precision and coverage to what places could the user have gone to, and what placed did they ultimately choose to visit. And it’s not as if geo-location analysis can’t be done more accurately. Whereas it can be difficult to decipher a specific location in densely populated urban areas, it’s a lot easier to determine when someone is inside a Walmart or other store that takes up a large chunk of land. 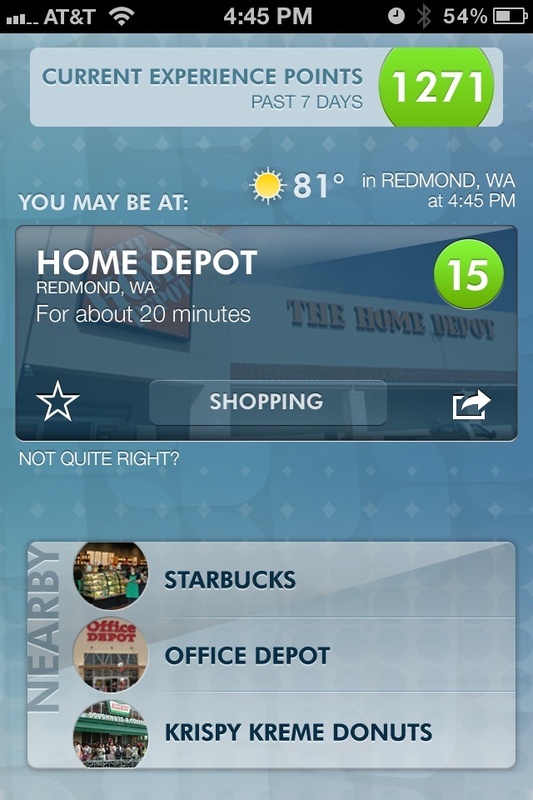 A report from Placed indicating when users are usually nearby. Other data, such as knowing when businesses are open and closed — something Placed’s business database includes — can help narrow the possibility even more by eliminating locations that aren’t open. Saga, a personal-assistant app for the iPhone (s aapl), will naturally assume you’re at the most-popular of a group of possible places, but learns users’ routines as they tell the app where they actually are. Although Hannan said Sense is not currently looking at adding data from external sources, I think it could be an effective method for improving accuracy in urban areas. Teaching Saga where you are. Knowing how often Saga, Foursquare or Facebook (s fb) users check into certain locations — even anonymously and in aggregate — could help algorithms make better judgments about where someone likely is. 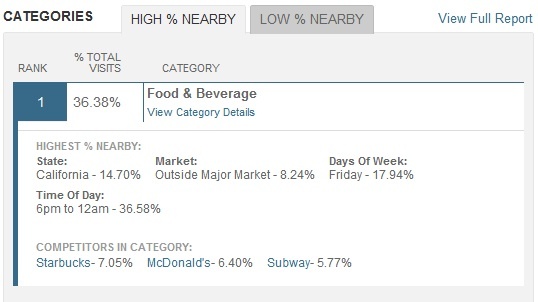 As Foursquare founder Dennis Crowley is slated to discuss Thursday at our Mobilize conference in San Francisco, companies like his are sitting on a treasure trove of data about where consumers spend their time in cities across the country. Based on correlations to other behavior (e.g., people who frequent Starbucks also frequent book stores) or just on the sheer popularity of a given place, geo-location models could give a more meaningful weight to each possible location. Mobile payments to the rescue? 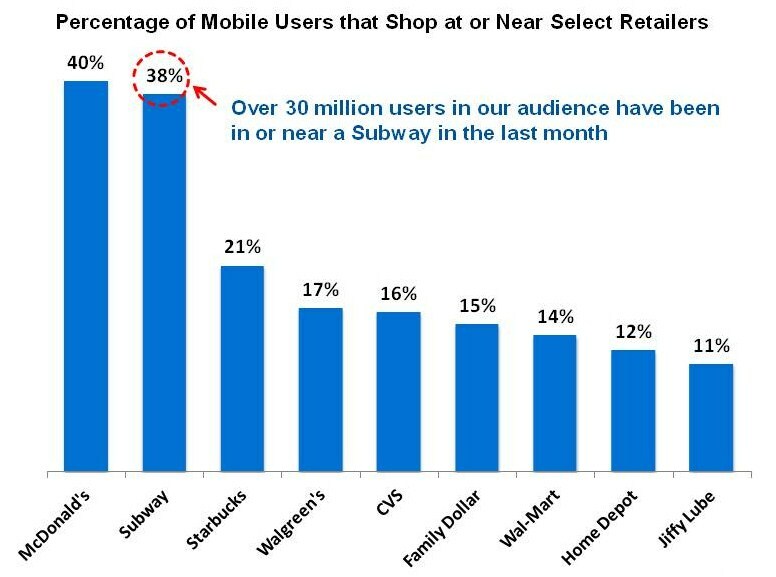 Rather, Hannan seems to be banking on the advent of mobile payments to drive the value of location analytics. Accuracy aside, he thinks a major limiter to the effectiveness of services like Sense’s is the difficulty of measuring conversions, or when a click on an ad translates into a purchase. There just isn’t an easy way to tell when someone clicking on a mobile ad actually goes into a store and buys something as a result. An easy way to alleviate this problem, Hannan said, would be for more businesses to accept coupons displayed on mobile devices, but a better way might just be for more commerce to carry out on the devices themselves. The trick, Hannan said, will be making the process as frictionless as possible for consumers. One-click purchasing, for example, even if it still requires going to pick something up at the store (like PayPal (s ebay) is now testing out), means that companies will get a much-clearer picture of how ad clicks convert into actual purchases. But all moves toward making location data more valuable to advertisters and, in theory, consumers are good news at this point. “It’s going to take some time for us and other players in the industry to show this is worth the time and is an effective way of targeting advertising,” Hannan said. The silver lining is that getting in during the early stages of the learning curve of location-based targeting isn’t too costly. The models might not yet be accurate to a dime and mobile payments are in their nascency, Hannan explained, but mobile real estate costs so much less than web real estate that it doesn’t take too much improvement to deliver a return on the mobile investment. Already, he said, using Sense’s full complement of services improves click performance by four times, which is not an insignificant amount of added consumer attention on your brand. Feature image courtesy of Shutterstock user Jojje.